Home » Regulations » How Can the Trucking Industry Go Green? In the ever-changing world we live in, the trucking industry could also be changing… for the better! So, how can the trucking industry go green? Green trucking initiatives are growing increasingly popular. Much of this popularity is because of the Federal Phase 2, Greenhouse Gas Emissions Standards that the federal government is updating and revising. The EPA (Environmental Protection Agency) and the NHTSA (National Highway Traffic Safety Administration) are the federal departments that publish these standards. In a nutshell, these departments set standards for emissions by tractor-trailers, vocational vehicles and heavy-duty pickup trucks or vans. Now you drivers might be thinking, “How does this affect me?” That’s what we will explore in this blog post! Why is there a Phase 2 and what does it do? The Phase 2 rule builds on Phase 1 which was introduced in 2011 and took effect between 2014-2018. Part of the hype around Phase 2 is that it introduces new controls on trailers as well as glider vehicles. It has a few HUGE benefits such as reducing carbon dioxide emissions, which is a common problem in the environment today. It also reduces the cost of transportation and helps expand innovation in clean energy. Another interesting fact about Phase 2 is that it not only builds on a lot of the benefits from Phase 1, but it actually can help pave the way for the future of trucking. Phase 2 has a lot of standards that are based on current technology as well as technology that isn’t fully developed yet. For example, future technology could create advances in engines, extended idle reduction, etc. Pretty cool right? We think so. How can the trucking industry go green, and how will it affect you? How can the trucking industry go green? You’ll see more environmental changes this year. It is easy to read about changes to the trucking industry, say “Yeah, alright” and then move on with your life. However, it is important that you acknowledge that one day, potentially soon, some of these changes will affect you personally. For example, Paccar Inc. (a.k.a. the company that owns Kenworth, Peterbilt, and even some international truck brands)’s CEO Ron Armstrong has made statements regarding the trucking industry moving towards more efficient and clean energy. At the 2019 American Truck Dealers Show, Armstrong made a statement saying: “The future of the industry is very dynamic, with technology accelerating the pace of change. Now more than ever, we need to innovate to stay relevant,” as published by ttnews.com. So, how can the trucking industry go green? Technology. New technologies and improvements will be introduced into the industry including more alternative fuel sources, more aerodynamic truck structures, LED headlights, and hybrid-powered trucks, just to name a few. Many different prototypes of energy efficient trucks are being tested right now including electric, hydrogen, and hybrid. In fact, Kenworth and Toyota are collaborating on prototypes of trucks that are powered by a hybrid combination of hydrogen power and electric power. These trucks won’t be on the market for a while. However, this is a big step in the right direction for the industry. LED lights are becoming more and more popular for truck manufacturers both inside and outside the truck. How can some lightbulbs help the trucking industry go green? LED lights are more powerful than normal light bulbs. They also last a lot longer and use far less energy than traditional bulbs. A lot of manufacturers are making lines of lights for trucks, and a lot of them are now switching over to the more energy efficient side of production – LED. As mentioned, LED lights last a lot longer than traditional light bulbs, about 50,000+ hours compared to 1,200 hours. That’s a big difference, especially in terms of the cost of replacing the bulbs. While LEDs are more expensive up-front, their long lifespans make it the more cost-efficient option. It’s no wonder trucking companies are making the switches both inside and outside the cabs! For a few years now, Zero-Emissions standards have been on the rise. Some states like California and Colorado have openly been in support of the growing ZEV (zero-emissions vehicle) movement, especially Colorado. The governor signed an order to help transition passenger vehicles so that they’re running on renewable energy by the year 2040. That seems a long way off, but good things often take time. Colorado even offers a $5,000 tax credit to those that own a passenger electric vehicle. Pretty cool right? There are also a lot of ways for fleets to improve their efficiency and reduce not only their costs but their carbon footprint at the same time. The North American Council for Freight Efficiency has put together a list of 85 different technologies that can help improve efficiency, so be on the lookout for some of these changes being made inside your cab! 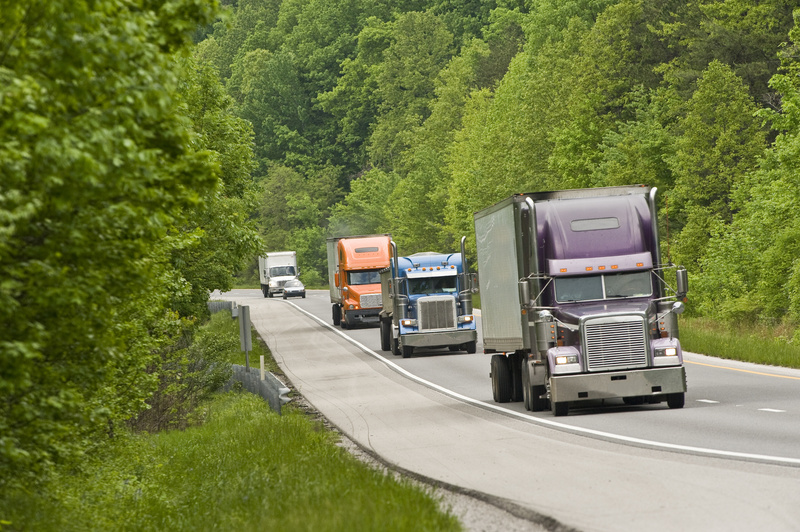 How Can the Trucking Industry Go Green with Your Help? While there are a lot of BIG changes coming with the green trucking initiatives, there are some small things that you can do in order to help the environment yourself. Don’t litter. – For a lot of people, this seems like a no-brainer. However, littering still happens more often than you would think. Although some states have fines in place for littering, it doesn’t stop anyone from throwing their trash out their window on the interstate or dropping a candy wrapper a few feet from a trashcan and leaving it there. The next time you’re tempted to throw something out (that isn’t biodegradable), stop. Think about how it is just as easy to hold on to that bottle or wrapper until you get to a trashcan or recycling bin. Recycle when you can. ­­– Having a cold, refreshing soda on the road can be one of the best feelings after a long day. Plastics are one of the most problematic disposable products these days. They can cause harm to animals and insects that are important for the ecosystem, as well as the earth itself. This is because plastics don’t naturally breakdown. Therefore, if you can hold on to your bottles or bags until you get to a recycling can, you are doing the earth a big favor. How can the trucking industry go green? These are just a few examples. Share your ideas with us in the comments below!